-Most second chances now require CPs to be lost, not main buildings. -Pink Grunt and Outriader training merged. -Kel’Thuzad’s ghost is now Invisible. -Updated many old spell tooltips. -Boosted Grom and Varok STR. -Boosted Pink starting income by 100. -Anub’arak now has +20 STR. -Nerfed Pinks Bloodpact Satyr hp by 100. -Reduced Cooldown of Anasterian’s Heal by 10 seconds. -Dwarven Warriors Mithril Armor nerfed. -Terminator base armor nerfed by 3. -Shysharks now have 4 more base armor and deal 5 more damage per attack base. -Hippogryph Riders now have +500 health. -Thanes now build as fast as normal units and have +250 health. -Reduced Keeper of the Grove mana to 400, down from 500. -Freya can no longer be raised. -Made the last sleeping mobs not sleep. -Finally fixed Sgt Doomhamer being active during Bloodpact. -Fixed a bug with Thrall and other heroes coming back during Bloodpact. -Book tooltip now says summoning takes 3 min. 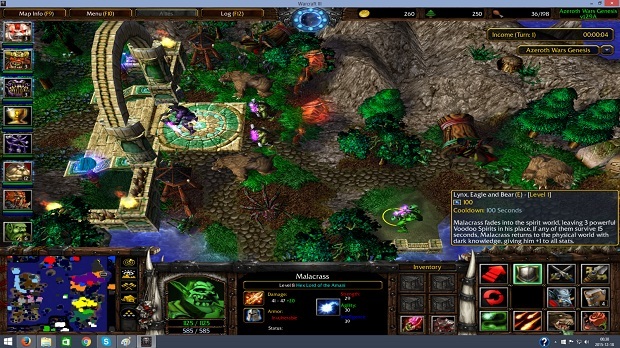 RESTART YOUR WC3 AFTER PLAYING THIS OR BIG GAMES LIKE LTA. OR RISK DISCONNECTING AT THE LOADING SCREEN!